March 28, 2012 by Alphageek in "alphageek", "review", "urbanspoon"
The alphageek applied some analysis to find a great restaurant. This process is analysis, if you count using urbanspoon to find some new restaurant to try. I have never had Afghan food before, but this was certainly a great introduction. It is easy to understand why this restaurant has an online buzz. I decided to call in an order an pick it up. After all, I don't have a dvr on the road, and I did not want to miss Survivor. 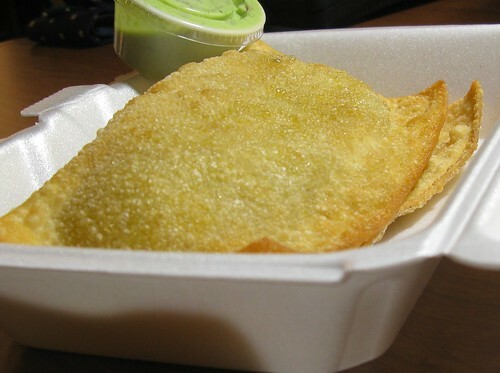 I decided to start out with Bolani, which is pan-fried twin pastry shells. One is filled with potatoes and the other with scallions. Although the pastry does not look spectacular, it was delicately fried, and full of delicate flavors. The flavors in both, were topped off with just a little bit of heat, making for a great start to the meal. For the main dish, I decided to try Chicken Tikka Kabob, dark meat chicken on the bone marinated in tandoori seasoning. I gave it a try, and I found that this was some great tandoori seasoning. The flavors transformed the chicken into something that one just can't get in your usual grilled chicken sandwich. The chicken was served on a pita that was almost pillow like. 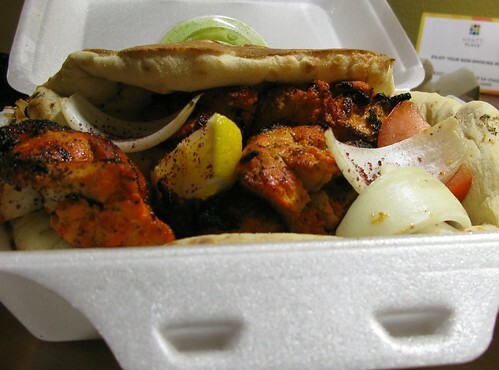 The pillow had absorbed the flavors from the chicken, making the pita almost a meal in itself. The chicken was served with some rice that might have been seasoned with cardamom and some cinnamon. The rice was interesting because it also had some raisins to compliment the flavors. These great flavors made the little salad that was served with the dish almost a second rate player, but it did not matter. In the end, this meal beat the heck out of getting something at one of those chain restaurants that are almost universal these days. Why not stop by, and give something a try? Why not join out site? You can follow us using the links on the page, or leave us some feedback below. You can follow us on twitter by just clicking the following link: Follow @ageekfood.